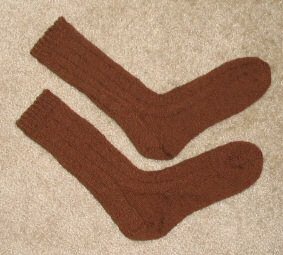 Leigh's Fiber Journal: Socks Finished !!!!!!!!! I've just returned home from the post office where I got my Dad's socks off in time for his birthday. What a relief. The photo isn't too impressive, but the socks are pretty plain anyway, at his request. 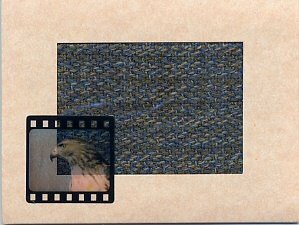 The inset is a twill sample I wove for a design board. It was an even greater relief that there was a few extra yards in the second skein, and so I could finish both socks. I was very happy to have m's suggestions, but was just as glad to be able to graft the toes without any further fuss. I'll remember her idea for the future however. I stayed away from both loom and spinning wheel in order to finish the socks, but I confess that I did take an occasional break from knitting to try my hand at kitty song writing, which is popular amongst cat bloggers at the moment. I don't reckon it will be my claim to fame, but it was fun. Now..... on to other fibery things. What a lucky dad Beautiful socks and card. Very nice with the woven insert just beautiful. Thank you Sheepshepherd! I appreciate your compliment. Cool socks. I,too, made my dad a pair of socks and they had to be knee high and of quiet color. I chose petrograph colorway from Lisa Souza (lisaknits) and that seemed to work. A sock notebook could be useful thing - good thinking.